After a successful first series in March 2016, the organizers of Mind The Gap X master class has announced the commencement of registration for the highly anticipated follow-up series themed: Family and Finances. 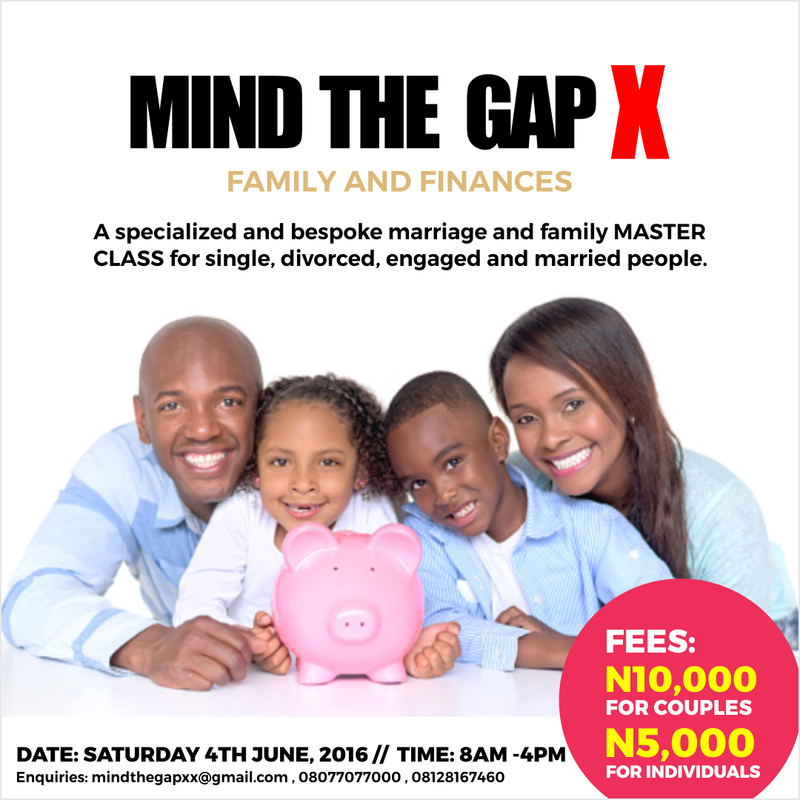 Mind The Gap X is a specialized bespoke marriage and family oriented masterclass for single, divorced, engaged and married people. Renowned life coach and psychologist, Lanre Olusola (The Catalyst), Senior Pastor and Founder of the Guiding Light Assembly (GLA) Wale Adefarasin and a host of financial gurus will be tackling issues that arise in relationships as a result of finances and also exploring ways to build wealth. Globally in recent times, studies have shown that many marriages end up in divorce or separation majorly as a result of financial issues. With the current economic crises, if proper care is not taken and knowledge applied; the results may be doubled as when the family is broken, the society ceases to function properly. At the Mind The Gap X Family and Finances master class, CEO, Common Sense Group & President, The Entrepreneurship Academy, Olumide Emmanuel would be helping couples work on their finances. How can families create alternate sources of income and wealth through investments? CEO, Abitos Financial Services Ltd & Non Exec. Director at Ecobank, Funmi Oyetunji will facilitate this segment. Money and God, is there a connection? Find out as Pastor Wale Adefarasin will be speaking on the subject. There is so much knowledge to be gained at this event learn how to manage your family finances and keep your home together. To be moderated by fmr. General Manager, Radio Continental - Ayo Owodunni. The master class which will run from 8am-2pm, will end with a free one-on-one family and finance coaching/therapy sessions for couples who are interested. Fees: N10, 000 for couples and N5, 000 for individuals. Coffee (provided by Nescafe) and lunch will be served. Step 1: Email us indicating interest at mindthegapxx@gmail.com and bank details will be sent to you. Step 2: Send us your full name, phone number, date of payment and amount paid to confirm payment and get pre-registered. Registration closes 27th May, 2016. In a recent seminar, I went to regarding money and family for my writing term paper help on ghostprofessors.com, I got hold of some ideas from married couples on how they handle their finances as husband and wife. That the wife has the say to most of their finances, that the husband has to give an ample amount of his salary to the wife as the wife will have to allocate or budget the money from food, school, bills and so on and so forth. However as we go along the discussion, this is not the case supposedly that both husband and wife should have a say on what to do with their finances, they have to talk, explain it further and to cut it short, they have to compromise and be open with each other that future misunderstandings regarding money should not be an issue or ground.